Birding Is Fun! 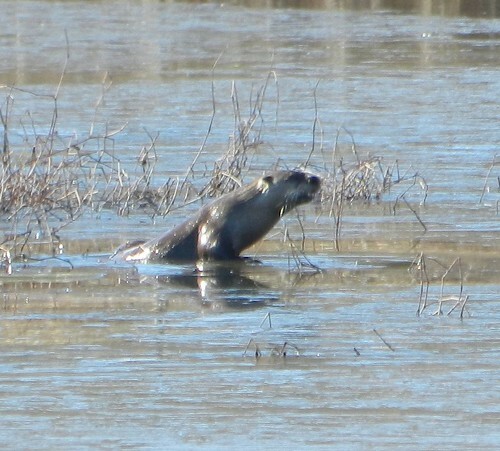 : When the birding is slow, watch otters! Haven't' been able to get out birding much, as I recently came down with the flu. I still don't feel 100% yet, but anyone that knows me knows that I can't stay indoors for long. The birding has been kinda slow for me locally. Since my girlfriend's favorite animal is the otter, I tried to think of a place to find them. I have read reports of many being seen at Muscatatuck National Wildlife Refuge in Seymour, Indiana. I have also heard that the birding is stellar there, and I have never been there before, so. After a two hour drive, I arrived at Muscatatuck. I was surprised at the size of the place, as I was envisioning a different kind of place. That being said, the place looked awesome to see some cool birds. It was unseasonably warm for January, so the birds weren't really moving. I spotted a Savannah and White-crowned Sparrow. Not much else of interest. I proceeded to the auto tour route. The place was slow bird wise, so we stopped at the first pond we came to. There was an observation platform, so we got out of the car and walked around. We immedialty saw some movement on the ice. 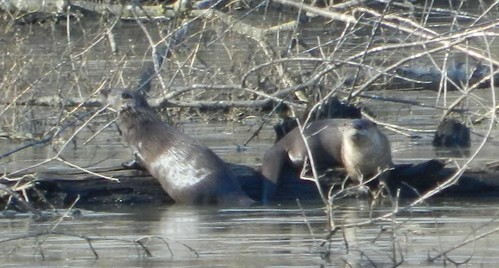 River otters!! Three of them. They were catching fish under the ice. I has been a very long time since I have seen river otters. I remembering seeing them often when I was a kid while fishing. The last one that I saw in Ohio was deceased. They are very rare in Ohio. 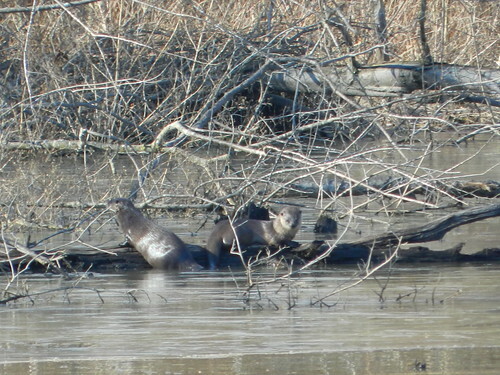 These otters have been reintroduced at Muscatatuck. Here is an otter breaking trough the ice. 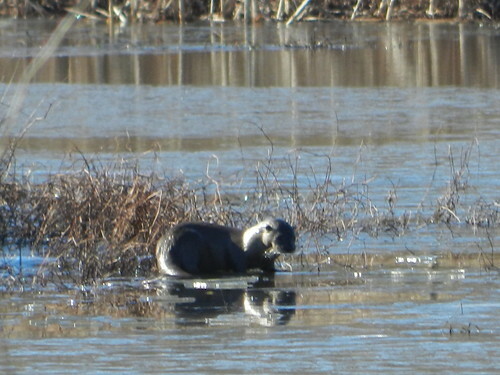 There were otters in almost every pond that we stopped at. They were at first very curious to our presence, but after a while they started to retreat for cover. The one swimming above was very curious of my girlfriend and swam up very close to her. 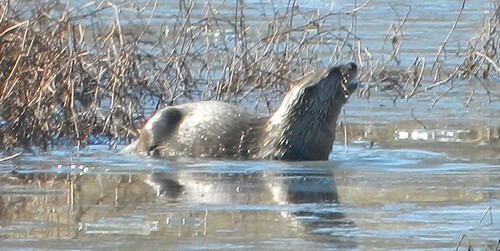 Otters are just as hard to photograph as birds. 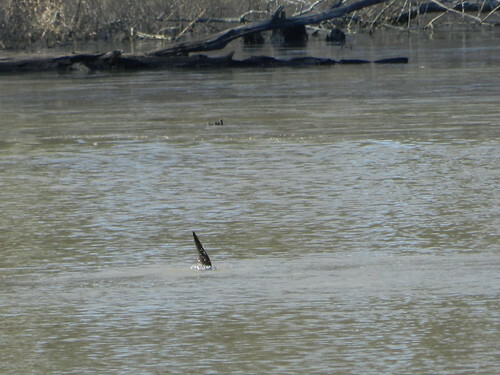 Here is a otter tail, as I missed the dive. You can almost see the disapproval of being watched on the one otters face. Watching the otters was a different experience. I enjoyed watching them as much as I do watching birds. Brought back memories of when I was younger. I remember otters, barn owls, and bobcats. Things are not the same. Since this is a birding blog, it wouldn't be right not to have some birds here. Even though the birding was slow, I did manage to see some good birds. Here is the first raptor seen on the auto tour. 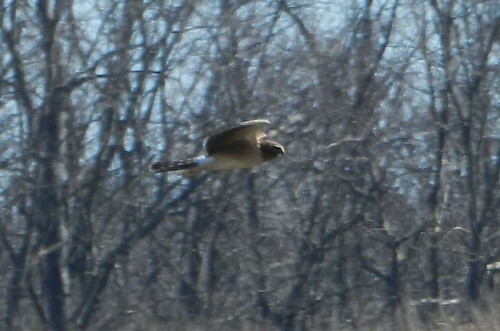 A far away Northern Harrier. We saw two of them. 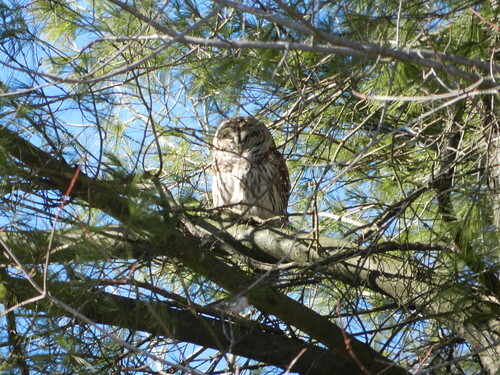 I also spotted this Barred Owl sitting in a tree sleeping on the side of the road. 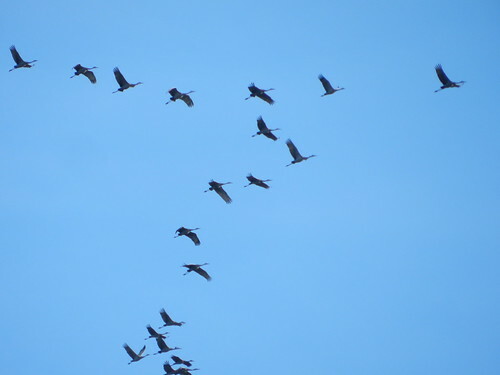 As the sun started to set, we saw thousands of Sandhill Cranes coming into the south closed area of the preserve. 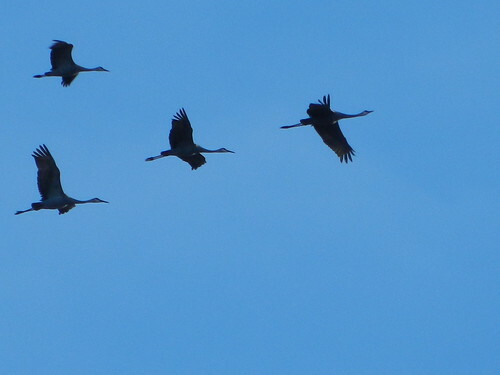 I am not too familiar with the area, so I couldn't get that close to see where they were landing. Love the sound and sight of sandhills! It was a very much needed help to my recovering from the flu. As I write this post, the temps are falling quick. The coldest it has been in a few years here. Hoping as the ice forms up north, it pushes some good birds down! Sounds like you had a wonderful adventure at Muscatatuck National Wildlife Refuge. 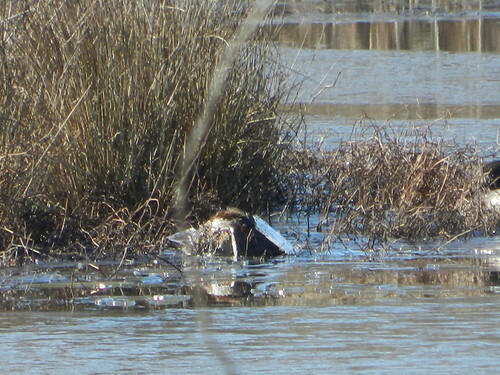 River Otters are so much fun to observe. Viewing your photographs certainly put a smile on my face. 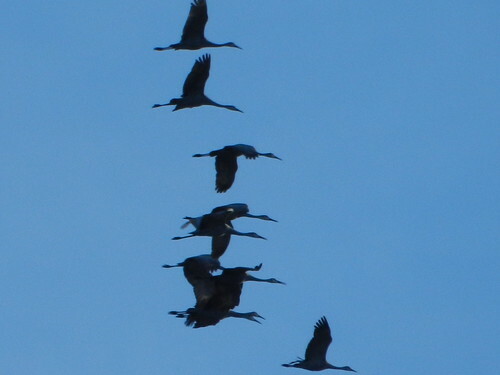 Love the snoozing Barred Owl and Sandhill Cranes in formation photographs! I hope you have recovered fully from the flu. River otters are really cool! I've also seen mink along the Boise River here.